(Natural News) Just like in any federal prison, one can easily locate the dregs of humanity. The worst criminals, liars, thieves, and low-life scumbags always get caught, at least eventually, ruining other people’s lives in the wake of their own greed and indifference. Today, a new “cell block” has been identified, where all the shills, charlatans, hucksters, and journalistic hacks have been cataloged, along with their “mug shots,” so that hopefully their negative impact on human health and the environment can be “arrested” and brought to an end. Antibiotic resistance is often pegged as a problem caused by the overuse of antibiotics — and this is a driving factor — but research suggests it may actually be only one piece to the puzzle. Environmental factors may be accelerating the rise of antibiotic resistance as well, particularly widely used herbicides like glyphosate (Roundup) and dicamba (Kamba). What exactly happened at the fire at the Horizons Council depot Levin, in January? We know that 1080 and other poisons were kept there. We are not told how much, although it could have been up to 100 tonnes. We know that local residents were not aware of the potential dangers of the toxic fumes that may have reached their homes. Note that the council have admitted that “1080 [poison] casing was damaged in the fire.” We also know that the local DHB and therefore the Medical Officer of Health were not informed about the fire via Fire & EmergencyNZ, nor Horizons, nor WorksafeNZ. This should have been a ‘notifiable incident’ with strict health and safety procedures in place, including an evacuation plan for nearby residents and drainage facilities for the fire equipment that prevented contamination of the water-tables. Will this ‘investigation’ result in any changes? An investigation into the suspicious fire at Levin’s Horizons Regional Council depot was stalled for a month due to hazardous substances. The January fire damaged property, equipment and vehicles stored at the depot. It was confirmed by police that the depot had been broken into and a quad bike set alight. Controversial pest control poison 1080 was stored at the depot along with herbicides for weeds, cyanide and rabbit toxins. Horizons chief executive Michael McCartney confirmed that a 1080 casing was damaged in the fire. Waste Management Technical Services recently removed and disposed of the hazardous substances, allowing Police to do an internal scene examination on Tuesday. Mr McCartney said the removal was a complex and time-consuming task but it was now completed and all poisons accounted for. He said the hazardous substances were not removed immediately following the fire to ensure their casings did not break. The information is based on the new report “GMO Myths and Truths” by EarthOpenSource.org. You can find more information here: http://earthopensource.org/index.php/… http://articles.mercola.com/sites/art… Watch out for the Genetically Modified Organism (GMO) myths and truths which provide educational materials concerning GM foods and health risks. Our waterways planet wide are now highly polluted and no longer safe to drink. Consequently, the water that’s fed to us in the town supplies is replete with chlorine, fluoride and other additives to prevent us getting sick. However, there is a long term sickness cost to that. Only 40% of NZ rivers are safe to even swim in now. The Manawatu river is the MOST POLLUTED river in the southern hemisphere. Someone got trench mouth from ingesting that river water. It’s contaminated with spirochetes that cause leptospirosis & lyme disease among other things (all in the article of the last link there). They’ve been polluting our waterways for the past century basically and continue to do so. We can no longer eat what remains of the food in our waterways … the whitebait’s nearly gone, birds are declining, eels are dying. All in the name of profits for the few. So it’s important to start the conversation on obtaining healthy water to drink. Town supplies are not healthy in the long term. This is a huge subject that’s been widely debated … best to research it & make your own informed decisions before getting sick. For more info on water & additives the authorities deem necessary for us to consume (even to the point of forcing them upon us), search categories (left of page) or check out our Water pages. The Corporation pages are a good starting point for the origin of all the pollution. Profits before people is their mantra. Watch The Corporation movie & see why. “It may safely be taught that THE ONLY ABSOLUTELY PURE WATER IS THAT PURIFIED BY DISTILLATION. Instruct the public how distillation can readily and cheaply be done. It furnishes a fruitful yield for the genius that will devise a small distilling apparatus for the use of every family. “You should DRINK AT LEAST ONE GALLON of purified water a day. Most of us drink only at mealtime and when we’re noticeably thirsty. Wrong. You can develop a habit of NOT drinking water and walk around being 66 or 67 percent water, instead of 74 percent, which is what your body needs. When you don’t have the water in you, you won’t ever have the energy you need. The very first thing I do to get people’s energy up is to increase the amount of water in their diet. Immediately, their energy goes up. When someone has dementia, the first thing I do is give them lots of cold water all day, every day. About three weeks later, I start to see their dementia dissipate because they have rehydrated their brains. Unfortunately, your brain actually shrinks as you dehydrate. By DRINKING LOTS OF PURE WATER, you get better neuron activity and better cellular chemistry, and you’re able to detoxify the cells with water. the knowledge alright, but who will listen and heed it? A video which has encouraged me to keep speaking up about these environmental risks to our health has been that produced by TED talks (they’re on Youtube also) called ‘The Dangers of Willful Blindness’ (the video is on our Home page). Gayla Benefield was just doing her job — until she uncovered an awful secret about her hometown that meant its mortality rate was 80 times higher than anywhere else in the U.S. Worse, when she tried to warn people of her discovery they didn’t want to know! How often we are faced with fact but choose not to believe. We adopt what I call the ‘three monkeys’ approach where it’s assumed, if we neither see, hear nor speak we’re safe … a lot like the ostrich really. But somewhere down the track we run the high risk of it all coming back to bite us on the proverbial rear end! Check our our Chemicals and Glyphosate pages … particularly note under Chemicals the 1080 page and how NZ is being bombarded with it. We consume the highest amount in the world, gradually ensuring there is a rapidly diminishing wild food supply. Another excellent source of information, a Kiwi site, is the Pesticide Action Network Aotearoa NZ (PANANZ). A disturbing prediction from statistics here. If you are a thinking person, you must do the research and see what has been happening here. Surely in an era of unsurpassed technology and expertise this should not be? Clearly you have an internet connection to be reading this, so research the topic particularly in relation to vaccinations. And keep an open mind. A researcher simply looks at all the facts and makes an informed decision, and there is plenty of information out there to sift through. Don’t just be lazy and accept the status quo. Believe me that’s no longer a safe way of proceeding through life. Here in this article the finger is pointed at, among other things, glyphosate. 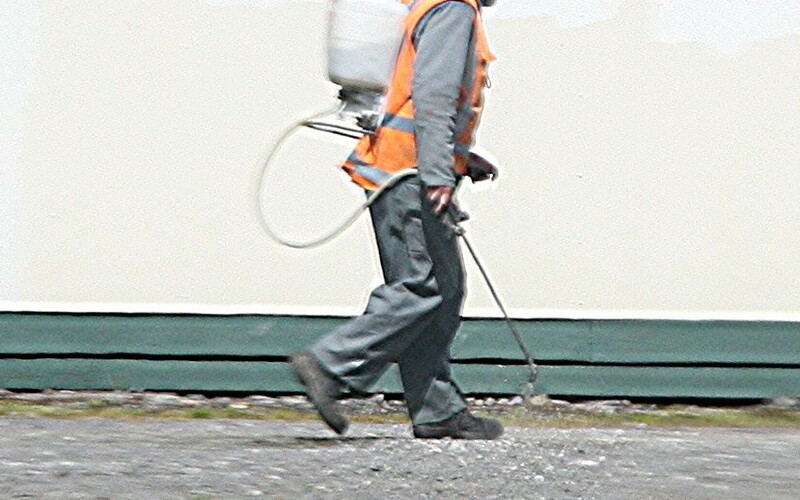 The finger is pointed particularly at glyphosate … here it is sprayed on the Rangitikei’s Marton Primary School walkway right by the school, and no warnings of spraying given. The Rangitikei District Council is adamant that glyphosate is perfectly harmless. This gloomy prediction was made at a GMO conference in December of 2014 by MIT senior scientist Stephanie Seneff, PhD. Originally a computer and artificial intelligence researcher, Seneff has shifted over the past several years to biology, with a focus on the impact of environmental toxins on our rapidly declining health. Aluminum toxicity has been an issue with Dr. Senef, so vaccines are part of her equation to autism. But possibly just as much is the pervasive abundance of glyphosate. She and her research partner Anthony Samsel researched the relationship of glyphosate based herbicides (GBH) such as Roundup to the epidemic of many modern diseases, including Celiac, Alzheimer’s and autism. Glyphosate is present in unusually high quantities in the breast milk of American mothers, way beyond the allowable levels of glyphosate in water. Urine testing shows Americans have ten times the glyphosate accumulation as Europeans. More than 90% of all soybean, cotton and corn acreage in the United States is used to grow genetically modified crops. Other popular and FDA approved genetically modified food crops include sugar beets, alfalfa, canola, papaya, summer squash, apples that don’t brown and bruise-free potatoes. However, if you have been led to believe that genetically modified foods were one of the main reasons why the world was enjoying food with less pesticide residues, you are being misled – the fact is, GMOs replaced one class of harmful pesticides with something more poisonous – neonicotinoids, dicamba, 2,4-D, DDT, glyphosate and its family of products including Round Up – and therefore ended up doing more harm than good. Lest you are thinking Kiwis, “we’re not affected by this over here”, as Kiwis who read the mainstream media often do, think again. Our stock is fed GE food (report the Greens) so it’s in our meat. Our pastures are also sprayed liberally with glyphosate (which our stock eats) and we had trial GE corn grow here in ’99 left to harvest with a raised threshold on GE’s acceptable levels, many thanks to Helen Clarke (all kept from the public at the time). It’s coming by increments. And it’s not labeled of course and since much of the corn and soy products found in so much packaged food now (that companies decline to declare the origins of) a very high percentage of that is GM. Search other GMO articles here under categories and check out the Glyphosate pages.